Case Backhoe Loaders are often overlooked in the industry when in fact they are one of the longest running machines and are made with quality parts. Whether working with a 480, 580 or 590 backhoe you are going to be working it hard and will need a few sets of tires throughout its life, Monster Tires hopes to be your resource for tires as long as you need them for a Case Backhoe or any other piece of construction equipment. While these machines run for so many hours Monster Tires will be here to replace every set of tires you will ever need for your Case Backhoe. Throughout the lifetime of a Case Backhoe, you will need to replace the tires many times to ensure your job site is safe. Running a tire to demolition on a Case Backhoe will end up costing you more money in the long run, cause downtime on the job site and put lives at risk. Being that Case is one of the most dependable machines on the job site, you want to make sure the tires you have on it are just as dependable. When tires are running on low tread, they pop easier and start to under perform under extreme conditions. 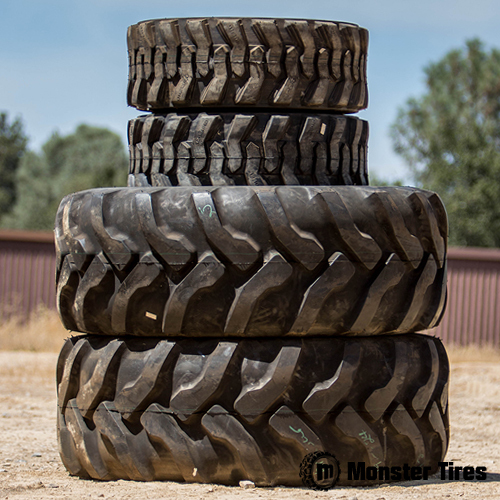 Monster Tires has the best tires for all makes and model Case Backhoes. From 590SK – 590SR Backhoe Tires to 580A – 580SR Backhoe Tires and 480C – 480F Backhoe Tires, Monster Tires has the exact tire you are looking for, for your machine. Don’t get caught on the job site running tire levels to low or else you will be looking at fines and penalties due to improper use of tires on your constriction equipment. Let Monster Tires get you out a replacement set of Front, Rear or both sets of Case Backhoe Tires.